We will have an award ceremony, music and auction during the event. We are still looking for sponsors. If you are interested in in becoming a sponsor, please check out our sponsorship information package. Have questions about this event? Contact us here. The South Bay Bicycle Coalition hosted a forum for the city council candidates to share their thoughts about the current situation and future opportunities for improving bicycle infrastructure to make MB a safer and more accessible city for individuals and families. 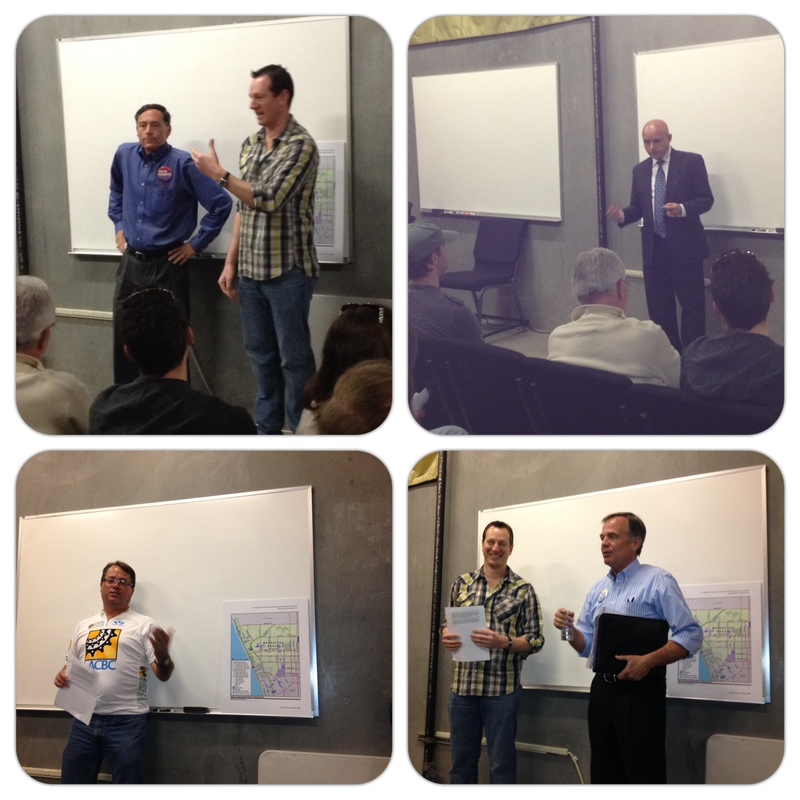 In attendance were Mark Burton, Mark Lipps, Tony D’Errico, and Wayne Powell. Mitch Ward was not able to make it, but did submit answers to the questionnaire given to each candidate prior to the forum. All endorsed the already passed Bicycle Master Plan as well as, if elected, supporting some staff time for state and federal grants to fund potential improvements. Bike safety was also mentioned often stressing that increased education may be one solution for bikers to better understand the rules of the road. Below are three questionnaires that were provided to the SBBC from Mark Lipps, Mitch Ward, and Tony D’Errico. Answer: I have many wonderful bike riding memories, from my very 1st candy apple red bike when I turned 5 to my Townie 21 at 59. I was a paper boy for 4 years and my bike and I were a team that had a lot of fun riding my route. I had a stingray bike that I use to ride through the dirt trails that are now the MDR. I have owned several road bikes, such as a Peugeot and a Kestrel. Now that I am 59, I own a Giant road bike but I prefer my Townie 21. My favorite memory was riding in my 20s from my apartment on 3rd and Ocean Park in Santa Monica to the old Marineland in Palos Verdes. I would take a short nap on the bluffs there and power ride back to my apartment. I took most of these rides in the offseason and I really had a lot of fun “opening up” on my way back to my apartment. members? If not, what changes would make you feel comfortable on our city streets? Answer: No. East to West riding for a family would be arduous due to our topography and the traffic on the major streets. East to West riding for families is more practical. Due to our hilly topography, family bike riding is limited. However, there are some east to west streets that may be suitable for such family bike riding; those streets should be officially recognized as such so there would be greater family bike ridership. Answer: Absolutely! Just as our MB 10K is a great family event for our MB residents, this MB family bike ride would have the same excitement and energy. 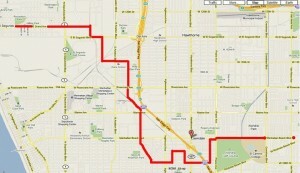 I would use the some of the same route currently used for the 10K. I can envision a great turnout with the course ending at Live Oak Park with a picnic. Answer: Absolutely! Fair and equitable treatment for bike riders is what it right. 5 In 2011, after 2 years of community input and a $240,000 professional study, the City Council unanimously adopted a comprehensive 20 year Bicycle Master Plan for an interconnected bikeway network with 28 new bikeway miles. How many miles of new bicycle facilities would you commit to implementing each year? Answer: At this time, I do not know how many miles can be implemented in the City of Manhattan Beach. I attended the mobility meeting at the Police and Fire Community room and I was disappointed to learn the consultant for the city had not considered our topography. I think the city has more work to do in identifying the right streets for bikeways in our city. We need to this correctly or our community will not give us the necessary support. Answer: Possibly. The key is the safety for the riders of bikes and the persons driving cars. I would like to know how many “commuters” would be using these bike lanes. I would imagine our traffic engineers may have some valuable input in this question. 7 The county provides sales tax monies, called Measure R funds, to each city for transportation only. Many cities like LA, Long Beach, and Redondo are spending 10% of these to fund bicycle and walking infrastructure. What %, if any, of Measure R would you support committing to bike and walk infrastructure if elected? Answer: I don’t know. Proposition R funds are limited and precious. I would need to look at all the issues pertaining to the uses for Proposition funds before making any commitment for bicycle and walking infrastructure. 8 Over the past 5 years, Redondo beach has received millions in funds in state and county grants for cycling. Our city has not applied for any. Would you support staff time for applying for bicycle infrastructure grants? Answer: I would need to know the percentages in the City of Manhattan Beach before making such an alignment. Unlike LA County, our revenue sources are limited. However, safety needs need to be supported with appropriate funding. 1 Please share a memory involving a bicycle that has had a lasting effect on you (whether or not you were the one on the bicycle). WE JUST LOOKED AT HOME VIDEOS OF MY THREE BOYS LEARNING TO RIDE THEIR BIKES. AWESOME TO SEE THESE NOW 21, 19 & 15 YR OLD GUYS AS LITTLE GUYS RIDING FOR THE FIRST TIME. 2 Would you feel safe riding a bike from east to west through our city with family members? DEFINITELY NOT AT NIGHT AND NOT SAFE IF YOUNG KIDS INVOLVED. If not, what changes would make you feel comfortable on our city streets? YOU WOULD NEED A DESIGNATED AREA FOR BIKES. 3 Would you support an annual active transportation community event (similar to LA’s CicLAvia) which would close a few streets for an afternoon and allow citizens to bike, walk, skateboard, and enjoy other healthy modes of transportation? ABSOLUTELY. GREAT IDEA. I THINK OUR COMMUNITY WOULD EMBRACE SOMETHING LIKE THAT. THESE TYPES OF EVENTS FOR ALL AGES HELP PRESERVE OUR SMALL TOWN CHARM. 4 Currently, bikers face the same traffic fines as drivers, up to $500. Several cities like Huntington Beach created optional classes allowing first-time offenders to go to “Biker’s Education” once to learn safer practices in lieu of paying the full fine. Would you support a similar program in our city? YES. 5 In 2011, after 2 years of community input and a $240,000 professional study, the City Council unanimously adopted a comprehensive 20 year Bicycle Master Plan for an interconnected bikeway network with 28 new bikeway miles. How many miles of new bicycle facilities would you commit to implementing each year? 20-YRS SEEMS LIKE A LONG TIME TO WAIT FOR A COMPREHENSIVE BICYCLE PLAN IN OUR CITY. TRAFFIC CONGESTION WILL NOT WAIT 20-YRS. 6 The three beach cities are studying the addition of bike lanes on Aviation to allow better commuting across cities. Do you support new bike lanes on Aviation without removing any traffic lanes? YES. NO PARKED CARS. AS A PUBLIC SERVICE FOR BIKE COMMUTERS I WOULD OFFER SBBC OR MB BRANDED REFLECTOR JACKETS. 7 The county provides sales tax monies, called Measure R funds, to each city for transportation only. Many cities like LA, Long Beach, and Redondo are spending 10% of these to fund bicycle and walking infrastructure. What %, if any, of Measure R would you support committing to bike and walk infrastructure if elected? 10% SEEMS FAIR. 8 Over the past 5 years, Redondo beach has received millions in funds in state and county grants for cycling. Our city has not applied for any. Would you support staff time for applying for bicycle infrastructure grants? ABSOLUTELY. WE ARE A PEDESTRIAN COMMUNITY. ONE OF OUR COMMUNITY ATTRIBUTES IS ONCE YOU ARE HOME YOU CAN LEAVE THE CAR AND GET ANYWHERE ON A BIKE.. IF THERE IS GRANT MONEY OUT THERE WE SHOULD BE ALL OVER IT. 9 LA County studies show that walking and bicycling make up nearly 20% of all trips and 39% of road fatalities, yet receive minimal funding. What steps would you take to better align funding with usage and safety? I THINK WE NEED TO BUILD OUT OUR INFRASTRUCTURE TO CREATE A MORE BIKE FRIENDLY BIKING COMMUNITY IN THE SHORT TERM NOT LONG TERM. THEREFORE WE HAVE TO CARVE OUT A PERCENTAGE OF THOSE BUDGETS WE USE FOR ALL OTHER MEANS OF TRANSPORTATION. 1 Please share a memory involving a bicycle that has had a lasting effect on you (whether or not you were the one on the bicycle). When I was growing up my younger brother and I had to share a bicycle that had red and white training wheels and a chain that was constantly breaking. That was difficult. Then I worked for my father in his business and saved enough money to buy a yellow 10 speed Schwinn. Sweet. 2 Would you feel safe riding a bike from east to west through our city with family members? If not, what changes would make you feel comfortable on our city streets? Generally yes – but it depends on the specific road, conditions, time, weather, etc. 3 Would you support an annual active transportation community event (similar to LA’s CicLAvia) which would close a few streets for an afternoon and allow citizens to bike, walk, skateboard, and enjoy other healthy modes of transportation? I would like to hold a public discussion about trying such an event. At that time we could determine which streets would be most feasible in doing this and also to see how it might affect our public safety vehicles needing access to proposed streets etc. I would like to explore it more, but I think it is a great idea. 4 Currently, bikers face the same traffic fines as drivers, up to $500. Several cities like Huntington Beach created optional classes allowing first-time offenders to go to “Biker’s Education” once to learn safer practices in lieu of paying the full fine. Would you support a similar program in our city? I am not aware of cyclists being fined $500 in Manhattan Beach. But I am open to options which would allow first-time offenders to go to an educational training class similar to the DMV sponsored driver education programs. 5 In 2011, after 2 years of community input and a $240,000 professional study, the City Council unanimously adopted a comprehensive 20 year Bicycle Master Plan for an interconnected bikeway network with 28 new bikeway miles. How many miles of new bicycle facilities would you commit to implementing each year? It’s difficult to just say I will commit to x number of miles. I am more interested in committing to bikeways that keep our communities fluidly connected and I am committed to working to make sure that happens as part of the Bicycle Master Plan. 6 The three beach cities are studying the addition of bike lanes on Aviation to allow better commuting across cities. Do you support new bike lanes on Aviation without removing any traffic lanes? Yes if there are no adverse safety issues for cyclists and motorists. Again in concept I support it if there is ample room for both cars and bikes to utilize the roads together. 7 The county provides sales tax monies, called Measure R funds, to each city for transportation only. Many cities like LA, Long Beach, and Redondo are spending 10% of these to fund bicycle and walking infrastructure. What %, if any, of Measure R would you support committing to bike and walk infrastructure if elected? I cannot lock in a commitment of Measure R funds for one specific area now. I would rather assess that at the time I am on council and then determine where these funds are best spent. But I certainly consider bike and walk infrastructure to be one of our highest priorities for these funds. 8 Over the past 5 years, Redondo beach has received millions in funds in state and county grants for cycling. Our city has not applied for any. Would you support staff time for applying for bicycle infrastructure grants? Yes. 9 LA County studies show that walking and bicycling make up nearly 20% of all trips and 39% of road fatalities, yet receive minimal funding. What steps would you take to better align funding with usage and safety? We need to ensure we adhere to the strategy in the Bicycle Master Plan and provide sufficient funding to execute it. Receiving my first 3-Speed “English Racer” when I was 11 or 12 years old. I rode it to school proudly every day. Not today. We need a strong education program to make sure both drivers and cyclists understand the rules and how to share the road. Would you support an annual active transportation community event (similar to LA’s CicLAvia) which would close a few streets for an afternoon and allow citizens to bike, walk, skateboard, and enjoy other healthy modes of transportation?Yes. We would need to coordinate with the city and local businesses as to times of the year and day to ensure full support wthout adverseley affecting those who should be supporting this great activity. Currently, bikers face the same traffic fines as drivers, up to $500. Several cities like Huntington Beach created optional classes allowing first-time offenders to go to “Biker’s Education” once to learn safer practices in lieu of paying the full fine. Would you support a similar program in our city?Yes, first-time offenders should be given an education opportunity. Education will go a long way to making our roads safe and sharable for all. While I need to be better informed on all the data relating to a committed number, I can say we need to start. The Master Plan has been approved but little has been done to lay the first mile. I would start with something that can be held up high as a success. I would not start with Aviation. Too divisive and risky. Start with a few easy success. They will go a long way to laying a solid foundation of support to grow on. The county provides sales tax monies, called Measure R funds, to each city for transportation only. Many cities like LA, Long Beach, and Redondo are spending 10% of these to fund bicycle and walking infrastructure. What %, if any, of Measure R would you support committing to bike and walk infrastructure if elected? Again, I need to be better informed on al the data relating to a committed number. Our city’s updated mobility plan will have pedestrian and Cycle components. That is a good start. Nest is to start somewhere will allocating funds to implement. Over the past 5 years, Redondo beach has received millions in funds in state and county grants for cycling. Our city has not applied for any. Would you support staff time for applying for bicycle infrastructure grants?YES!!!! Education at every age level is a necessary stating point. I have travelled extensively throughout Europe during my bunness carrer. Cohabitation on the roads is a way of life. But that did not happen over night. 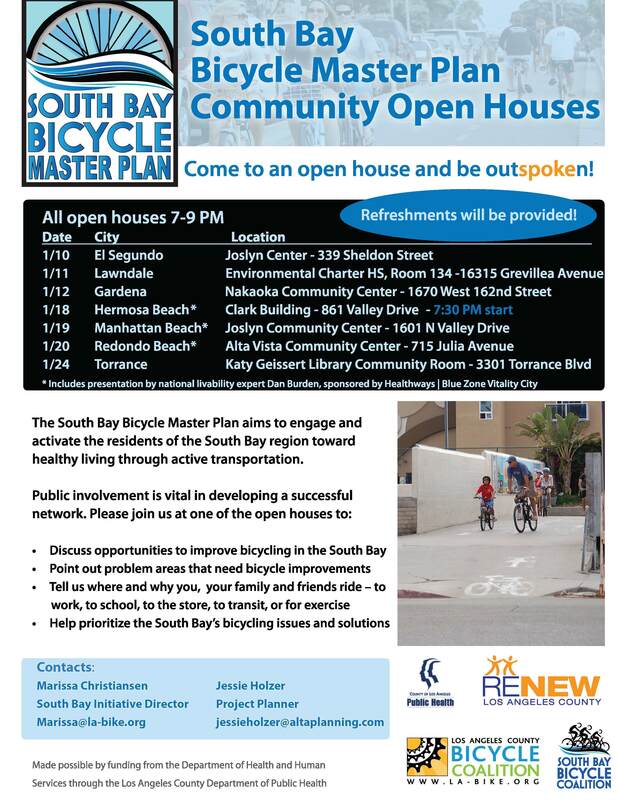 The second round of workshops in support of the South Bay Bicycle Master Plan initiative are now scheduled for later this month and on into early July. Six meetings are planned to cover all seven cities (Lawndale and Gardena are being covered in a single combined meeting. The key focus of these meetings – the draft Master Plan. The draft will be available to the public as of June 13 and we need to public to review it and come to one of the planned meetings and give us your feedback. 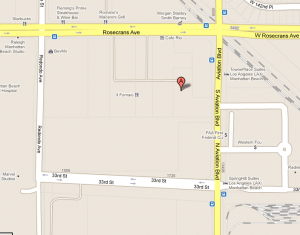 (310) 727-0728) – see map below. We’re still working out a few details with potential detainees, uh sorry, guests but we do know the meeting will include a Master Tech presentation on getting your bike ready for spring/summer riding (it is that time of year you know!). So come, bring friends and join us next Tuesday! A Community Workshop is Coming to You in Mid-January! Join us Tuesday October 19th to hear Charlie Gandy discuss all the innovative and progressive bike facilities that are being implemented in the City of Long Beach. For those of you who don’t know, Charlie Gandy is the Mobility Coordinator at the City of Long Beach and has been a leading bike and pedestrian planner in cities all over the country. He’s considered a leader in his field and has received high praise for all that has happened in Long Beach recently. Long Beach will be used as an example for our own South Bay cities to follow, so come see what we’re modeling ourselves after. 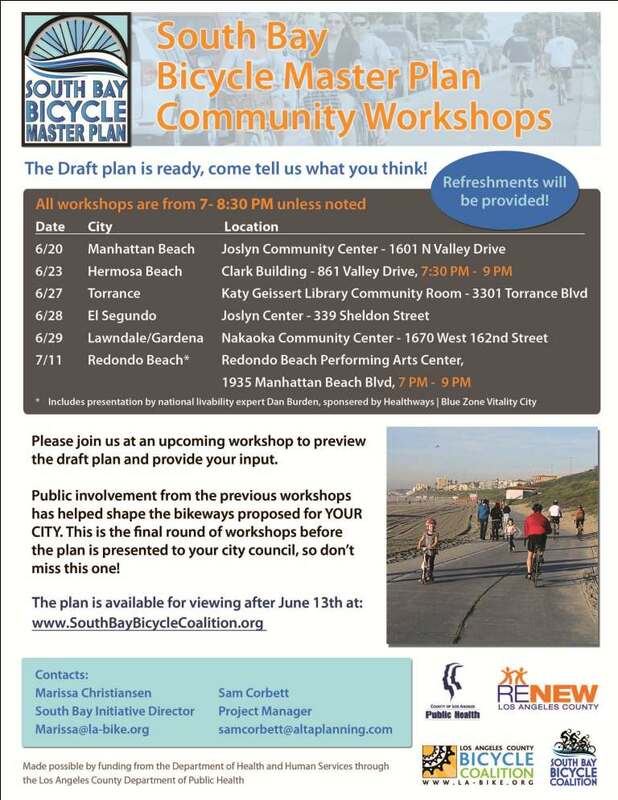 Learn more about Long Beach bike planning here. We will also be discussing future volunteer opportunities. The Bike Counts for the Master Plan will likely occur in early November and we will need volunteers!!! LACBC and our consultants will provide training for our volunteers. 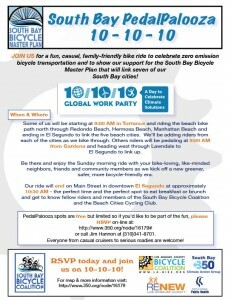 10/10/10 – The South Bay PedalPalooza! 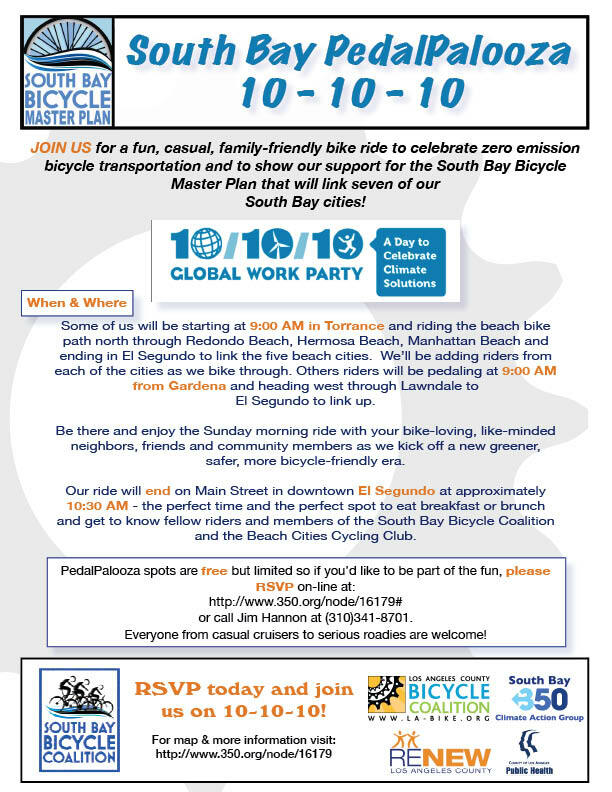 Join us for a fun, casual, family-friendly bike ride to celebrate zero emission bicycle transportation and to show our support for the South bay Bicycle Master Plan that will link seven of our South Bay cities! Please RSVP on-line at: http://www.350.org/node/16179# or call Jim Hannon at (310)341-8701. Everyone from casual cruisers to serious road racers are welcome! SBBC Board member Mariano Velazquez will be leading the riders starting at 9:00 AM from Gardena, on the corner of Manhattan Beach Blvd. and Van Ness Street. Our East-to-West group will meet up with our Lawndale PedalPalooza riders at 9:30 AM in the front of Environmental Charter High School, at 4500 163rd Street. 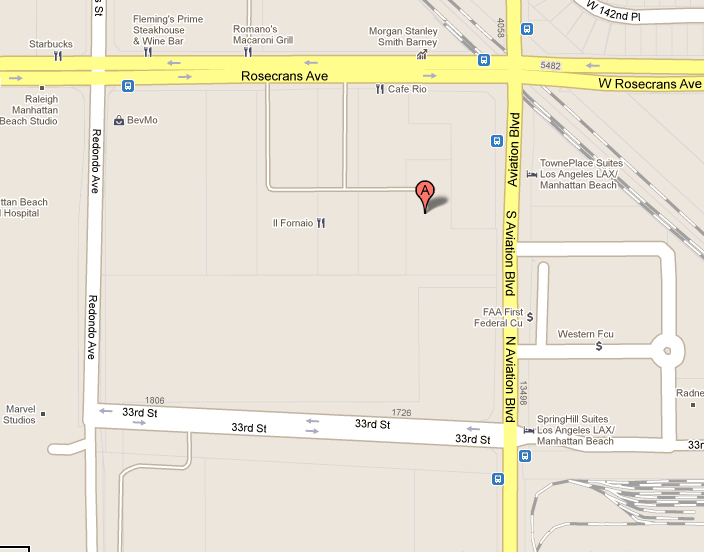 From there we’ll ride on to El Segundo following the route on the attached map. It’s been chosen for safety and accessibility and the total mileage to El Segundo is just about 9 miles, and very bike-able!